Even though scorpions and spiders are technically cousins in the animal kingdom, this Scorpion does not get along well with spiders! MacDonald “Mac” Gargan is one of Spider-Man’s earliest enemies, debuting way back in Amazing Spider-Man 19 (1964). But, he remains popular to this day, despite routinely being bested by the Wall Crawler. 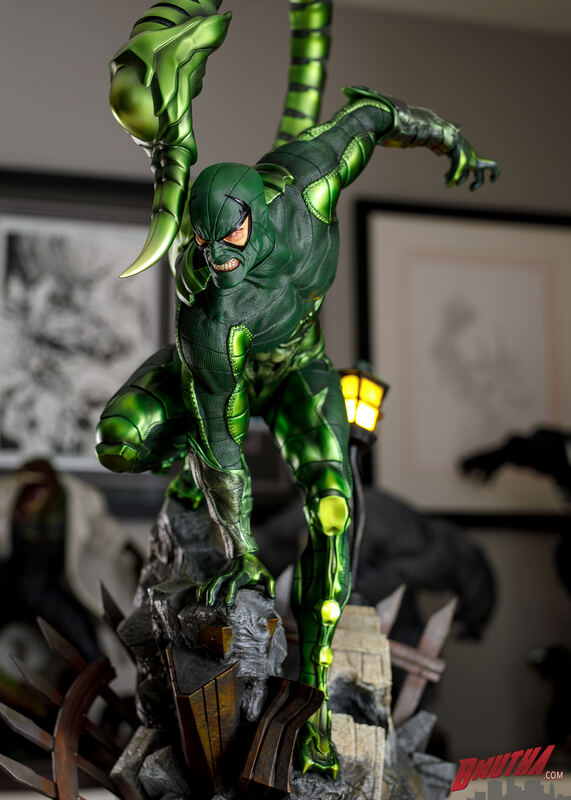 In this statue from XM Studios, sculpted by Caleb Nefzen, dare we say the green clad villain may never have looked better? Keep an eye out for the review coming soon. DID YOU KNOW: Mac Gargan was originally a private investigator hired by non other than J Jonah Jameson! He was tasked with the job of finding out how Peter Parker was able to get such great photos of Spider-Man. After repeated failures, Jameson actually funded the experiment that eventually led Mac to be transformed into the deadly Scorpion! Blaming him for his current insanity, J Jonah Jameson the only person that Mac Gargan hates more than Spider-Man! Posted in Unboxing, XM Studios and tagged Marvel, Spider-Man.